Thyroid disease affects millions of people in the United States, according to MedLine Plus. If your thyroid produces too much or not enough hormone, it can lead to problems ranging from weight changes and temperature sensitivity to cardiovascular issues. Thyroid problems generally require medical treatment, but in some cases, adding more walnuts to your diet may also help improve thyroid function. If your thyroid's hormone production is too low, you have hypothyroidism, a common condition that can cause you to gain weight, be uncomfortable in cold temperatures and feel tired and run down. High thyroid hormone production is rarer: This condition, called hyperthyroidism, speeds up your heartbeat in addition to causing weight loss and sensitivity to heat. If you suspect you have a thyroid condition, see your doctor for diagnosis and treatment. 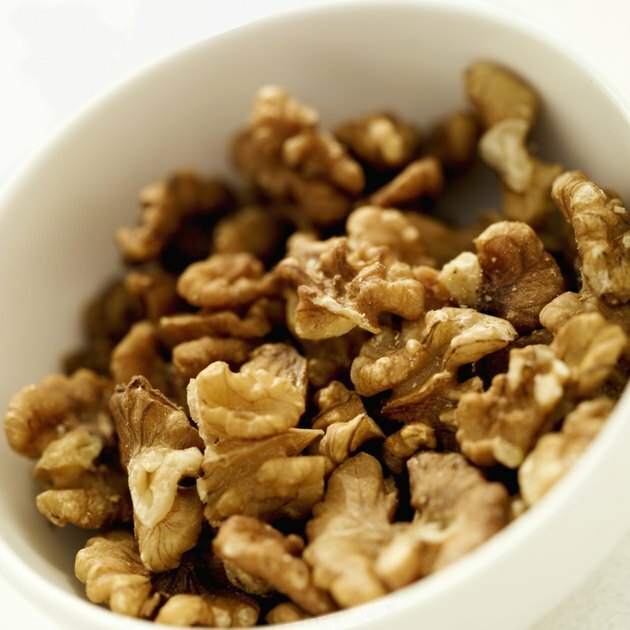 Don't try to self-treat a thyroid condition with walnuts or other remedies. Black walnuts are a good source of selenium -- 1 ounce of dried black walnuts has 5 micrograms of selenium, about 7 percent of the daily recommended value for this essential trace mineral. The relationship between selenium and thyroid function is still under exploration. However, low selenium levels have links to hypothyroidism and may be a causal factor for this condition, especially when combined with low iodine levels, according to the Office of Dietary Supplements. Sufficient levels of selenium may also reduce your risk for swelling of the thyroid, or goiter. Although the relationship between walnuts and thyroid health is unclear, walnuts can be an important part of any healthy diet. In addition to being a source of healthy fat and protein, walnuts are also one of the best nut sources for antioxidants. Your diet plays an important role in your overall health, so talk to your doctor or dietitian about how walnuts fit into your diet and your thyroid treatment. If you're taking a synthetic version of the thyroid hormone like levothyroxine, you may want to avoid walnuts. Walnuts, like high-fiber foods and infant soy formula, make it harder for your body to effectively absorb the synthetic hormone, according to Drugs.com. Ask your doctor or dietitian before adding walnuts to your thyroid treatment regimen. How Much Kelp Should You Take for Hypothyroidism?